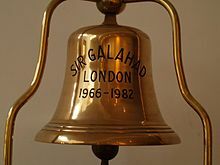 For other ships with the same name, see HMS Sir Galahad. 2 Mirrlees National ALSSDM10 diesels. Armament: Two 40 mm Bofors AA guns. RFA Sir Galahad (L3005) was a Round Table class landing ship logistics (LSL) vessel belonging to the Royal Fleet Auxiliary of the United Kingdom. The ship saw service in the Falklands War of 1982, where she was bombed and set afire at Fitzroy on 8 June in the worst British setback of the war. She was first managed for the British Army by the British-India Steam Navigation Company, before being transferred in 1970 to the RFA, and was manned by Hong Kong Chinese civilian crew. The Sir Galahad was a 3,322-tonne LSL built by Stephens and launched in 1966. She was built to merchant standards, which aided her destruction. She could carry 340 troops or, when necessary, 534 for short periods. Cargo capacity could include 16 light tanks, 34 mixed vehicles, 122 tonnes of fuel and 31 tonnes of ammunition. Landing craft could be carried in place of lifeboats, but unloading was mainly handled by three onboard cranes. In November and December 1970 Sir Galahad was involved in Operation Burlap giving humanitarian assistance to East Pakistan after a cyclone caused extensive damage and flooding. Sir Galahad was active during the Falklands War, sailing from HMNB Devonport on 6 April with 350 Royal Marines and entering San Carlos Water on 21 May. On 24 May 1982 in San Carlos Water she was attacked by A-4 Skyhawks of the Argentine Air Force's IV Brigada Aérea and was hit by a 1000 pound bomb dropped by Lt. Luis Alberto "Tucu" Cervera's A-4, (which did not detonate) then strafed by Dagger fighter bombers. After removal of the unexploded bomb, she carried out supply runs to Teal Inlet along with RFA Sir Percivale. On 8 June 1982 while preparing to unload soldiers from the Welsh Guards in Port Pleasant, off Fitzroy, together with RFA Sir Tristram, the Sir Galahad was attacked by three A-4 Skyhawks from Argentine Air Force's V Brigada Aérea, each loaded with three 500 lb retarding tail bombs. At approximately 14:00 local time RFA Sir Galahad was hit by two or three bombs and set alight. A total of 48 soldiers and crewmen were killed in the explosions and subsequent fire. Her captain, Philip Roberts, waited until the last minute to abandon ship and was the last to leave. He was subsequently awarded the DSO for his leadership and courage. Chiu Yiu-Nam, a seaman on RFA Sir Galahad, was awarded the George Medal for rescuing ten men trapped by a fire in the bowels of the ship. During the attack on 8th June, the fires were out of control. The main part of the evacuation of the injured and wounded was carried out by the ships Royal Marine Detachment. The Royal Marines organised the launch of life rafts from the bow of the ship, whilst at the same time marshaling helicopters for personnel to be winched clear. Immediate first aid was given to those most seriously wounded and a triage system set up. The actions of these few Royal Marines undoubtedly saved lives on the day, though only one, SGT Dolivera, received a Mention in Dispatches. The Royal Marines were the last personnel to abandon ship. The same Royal Marines had also returned to the RFA Sir Galahad to assist the Royal Navy EOD team in defusing the 1000lb bomb which crashed through the side of the ship without exploding on 24th May 1982. All had returned onboard as volunteers and assisted in physically carrying the unexploded bomb through to the rear Tank Deck ramp, where it was placed in an inflatable boat (filled with packets of cornflakes to act as padding) and taken out into San Carlos water where the boat was punctured and sank. BBC television cameras recorded images of Royal Navy helicopters hovering in thick smoke to winch survivors from the burning landing ships. These images were seen around the world. Other units affected include 3 Troop (of 20 Field Squadron, 36 Engineer Regiment) which was temporarily attached to 9 Independent Parachute Squadron Royal Engineers and was being transported on the Galahad to provide engineering support following the landings. Engineers feature prominently in contemporary footage showing two lifeboats landing survivors. Also 16 Field Ambulance (RAMC) were on board and assisted with the treatment and evacuation of the many casualties. On 21 June, the hulk was towed out to sea by the RMAS Tug Typhoon and sunk by HMS Onyx; it is now an official war grave, designated as a protected place under the Protection of Military Remains Act. Guardsman Simon Weston was among the survivors of the attack on Sir Galahad. He suffered 46% burns and his story has been widely reported in television and newspaper coverage. Ten years after Sir Galahad was sunk, Weston was awarded the OBE. Other survivors included the intelligence consultant Crispin Black. A replacement ship entered service in 1988, carrying the same name and pennant number. ^ Puddefoot, Geoff (2010). The Fourth Force: The Untold Story of the Royal Fleet Auxiliary Since 1945pp. 22,110,111,122. Seaforth Publishing. ISBN 978-1-848-32043-7. ^ Roberts, John (2009). Safeguarding the Nation: The Story of the Modern Royal Navy. Seaforth Publishing. ISBN 978-1-848-32043-7. ^ "Crew of RFA Sir Galahad Roll of Honour". Family Announcements. 9 January 2009. ^ a b "Falklands hero's courage under fire". Bournemouth Echo. 25 September 2010. ^ "Chiu Yiu Nam obituary". Telegraph. 7 March 2012. ^ "The War Within". South China Morning Post. 10 June 2007. ^ "Disaster for British at Bluff Cove". BBC News. 23 March 2012. This page was last edited on 6 April 2019, at 23:36 (UTC).